Sorry, we have no items in stock. The Canon 7D Mark II is one of the best DSLR cameras for advanced enthusiast photographers who may also be interested in video recording. Featuring a high-resolution 20.2-megapixel APS-C CMOS sensor, the Canon 7D Mark II is a great camera for capturing a superb level of detail in a wide variety of scenarios. 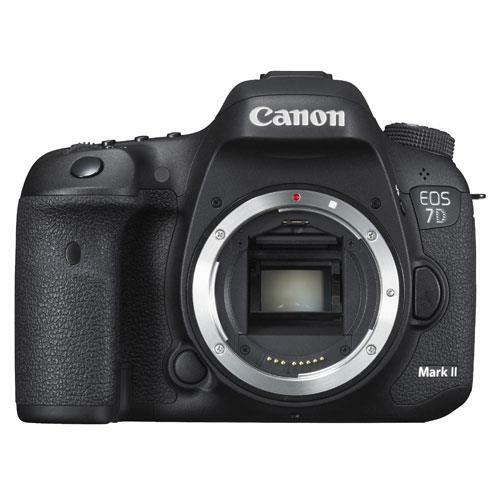 Compatible with Canon’s broad range of EOS lenses, the 7D Mark II is a popular second body or primary camera for people interested in photographing portraits and landscape photography, but it’s particularly suited to action, sports and wildlife photography due to its APS-C sensor and speedy functionality. Photographing fast-moving subjects is made significantly easier with the Canon 7D Mark II as it features an advanced 65-point cross-type Dual Pixel AF system, providing highly accurate and fast focusing. The camera’s advanced AF can also focus in conditions as dark as -3EV, equivalent to moonlight. Harnessing the power of dual Canon DIGIC 6 processors, the 7D Mark II is capable of capturing full resolution images at a rapid 10fps for continuous burst mode shooting. Canon’s advanced 150,000-pixel metering sensor with IR detection enables the 7D Mark II to deliver consistent exposures in even the most challenging of lighting scenarios. The combination of dual DIGIC 6 processors, advanced 20.2-megapixel sensor and 65-point Dual Pixel CMOS AF enables the Canon 7D Mark II to lock onto and track subjects across the frame. The Canon 7D Mark II features a solid, weather-sealed design, with a solid grip and customisable controls, making it a popular choice amongst professional photographers who work in a variety of challenging environments. For photographers who travel, location-based geotagging can be enabled in the 7D Mark II via built-in GPS. Additionally, the camera has dual card slots, offering SD and CF card compatibility, giving photographers the chance to extend storage capacity or automatically create a backup of their images. The video capabilities of the 7D Mark II make it one of the best DSLR cameras for video recording. It can record video in detailed Full HD resolution at variable frame rates up to 50 or 60fps, suitable for capturing vivid fast action and producing slow motion video. Focus tracking sensitivity can be adjusted when recording video to allow for smooth automatic focus pulling between subjects. The Canon 7D Mark II has an HDMI output for capturing Full HD (1920 x 1080) footage to external recorders, as well as headphone and microphone sockets, making it suitable for professional workflows.